Blockchain and distributed ledger technology can catalyze a wide range of innovation. We have seen these technologies used to create financial instruments, sometimes in the form of tokens or coins that can provide investment opportunities like those offered through more traditional forms of securities. Depending on the nature of the digital asset, including what rights it purports to convey and how it is offered and sold, it may fall within the definition of a security under the U.S. federal securities laws. As part of a continuing effort to assist those seeking to comply with the U.S. federal securities laws, FinHub is publishing a framework for analyzing whether a digital asset is offered and sold as an investment contract, and, therefore, is a security. The framework is not intended to be an exhaustive overview of the law, but rather, an analytical tool to help market participants assess whether the federal securities laws apply to the offer, sale, or resale of a particular digital asset. Also, the Division of Corporation Finance is issuing a response to a no-action request, indicating that the Division will not recommend enforcement action to the Commission if the digital asset described in the request is offered or sold without registration under the U.S. federal securities laws. This framework represents Staff views and is not a rule, regulation, or statement of the Commission. The Commission has neither approved nor disapproved its content. This framework, like other Staff guidance, is not binding on the Divisions or the Commission. It does not constitute legal advice, for which you should consult with your own attorney. It does not modify or replace any existing applicable laws, regulations, or rules. Market participants are encouraged to review all the materials published on FinHub. To be fearless, you have to set up the right conditions and environment. Taking this perspective to heart, #FFCON19, a conference put on by the National Crowdfunding & Fintech Association, pondered how to create the right conditions so entrepreneurs can be fearless in their work. From conversations about AI creating fake videos to open banking, the wide-ranging conference detailed that fearlessness comes from using the right tech at the right time, desiring a positive outcome more than wanting to avoid a negative outcome, and putting the right regulations in place. Kicking off the conference, entrepreneur Toufi Saliba brought the idea of ‘deep fake’ to the conversation, the premise that artificial intelligence technology can make videos appear to be of certain people. “Deep fake enables everyone with a computer to download software to enable you to put someone speaking in a video, saying something they did not actually say,” Saliba explained. While innocently used in gag videos, the negative side is much more concerning. With this technology, said Saliba, hackers and other malicious actors can declare war, pretending to be a head of state. “Imagine seeing Barack Obama on video, except it’s not actually Barack Obama,” Saliba said, explaining that with deep fake technology, someone can film themselves speaking and gesturing but have it appear on screen as anyone. Saliba went on to explain that cryptography – the computer science practice of securing files with nearly-impossible-to-hack hash codes – can help identify whether a video is real. If cryptographic platforms reach mainstream use, each person will have their own identifying code, as will each video. If there’s a fraud concern, the platform can verify if the source of the video that seemingly features Person A actually came from Person A. While this technology theoretically exists today in the form of official passwords and ‘verified’ accounts, cryptography adds an incredibly high additional level of security, offering true ‘verification’ of the source. Once you can verify the source of information, a must for fearlessness since it helps reduce the unknown and manage risk, entrepreneurs must find additional ways to deliver value. John Lyotier, CEO of decentralized communications framework RightMesh, added that in the 21st century, providing value also means relinquishing control. In a classic blockchain industry pushback on central systems, Lyotier argued that providing real value to the world means not controlling but simply facilitating. This seems in line with Saliba’s commentary about cryptography and deep fakes – no human is verifying the videos, only decentralized computer nodes. He said the job of a trusted agent – for example, an accountant, consultant, or lawyer – is to “sit between those who want and those who have, then put the two together”, but made the bold claim that those individuals are to be “disrupted and disintermediated”. With a trust system based on humans, there is an inherent limit to how much trust someone can put, said Lyotier, since they are ultimately relying on people who can be perversely incentivized. Instead, the new method of providing value is to enable people to connect one-to-one on a global scale without a human in the middle. The entrepreneur believes blockchain is the technology that will deliver the promise of increased value and decreased central control, but he was not so naive as to think that the whole world would simply switch over. Lyotier echoed a comment made by Saliba that new platforms must deliver incredible efficiency gains to get people on board, but he re-phrased the question to be: how do you incentivize people to take action? For him, that’s the potential value of RightMesh’s proprietary cryptocurrency, but he left the question open ended for the audience to ponder. On the subject of regulation and ensuring support for scaling startups, a day-two panel took aim at Facebook’s famous “move fast and break things” mantra. When it comes to regulation, said the panel, you have to go a little slower at first to get regulation right. Then you can move fast and break things, because the frameworks that protect investors act as bumpers to keep you on track. Once regulations are set up to both protect those who need protecting without stifling risk taking, then innovation can truly take place. Like most other industries, competition in financial services is intense. As it is a highly regulated sector of industry, participants must continuously manage compliance demands while interacting with diverse public officials and regulatory requirements. These same rules, if duplicative or misaligned, can act as a barrier to positive innovation and change that challenges established firms and entrenched orthodoxies. The emergence of Fintech and the digitization of financial services, from banking and beyond, has seen multiple Fintech centers of prominence emerge. The UK has long been known for its Fintech friendly regulatory environment. Regulators frequently engage with emerging new business models as it is mandated for these officials to foster competition. In Hong Kong, an important global financial center, public officials have not only talked about fostering Fintech innovation, but much money and resources have been dedicated to encouraging innovation. Fintech is viewed as strategically important to maintain a dominant position in the global financial industry. So can Canada do more? Crowdfund Insider recently reached out to Michael King for his perspective on the status of Fintech in Canada. King is co-Director of the Scotiabank Digital Banking Lab at Ivey Business School and an advisor to the National Crowdfunding and Fintech Association of Canada. He spent multiple years in the private sector working in the global banking industry so he has plenty of hands-on experience. King recently created a helpful database of Fintechs operating in Canada which provides a good overview of these new firms. King believes Canadian officials, both regulatory and elected, must do more to catch up in the international race to remain relevant and competitive in the global financial sector. So will Canadian policymakers listen? Our conversation is shared below. Which international jurisdictions do you believe are doing the best in fostering Fintech innovation? Michael King: The leading jurisdictions for Fintech are the UK, Australia, Hong Kong, and Singapore. Each of these countries has outlined a national strategy to be a leader in Fintech and is coordinating both public sector and private sector bodies towards achieving this goal. These small open economies understand that financial services are a global industry that has been opened up to foreign competition by the internet, cloud computing, smartphones and other technologies. Canada is lagging, with no coordination nationally and harmful competition between Fintech centres across Canada. Which sectors of Fintech do you believe hold the most promise? Michael King: The payments sector is the front line of the battle between Fintechs and incumbents. This trillion-dollar industry is complex, with many players collaborating and competing in overlapping networks. Consumers and businesses face many pain points, such as high costs, slow transfers, poor service and little to no transparency. Payments is where the largest and most successful Fintech companies have made their mark, led by PayPal, Square, Stripe and Adyen. Canada’s Lightspeed POS is the leader in this space, although there are dozens of smaller start-ups targeting lucrative segments of this value chain. Payments is also the space where global technology companies are able to compete most effectively by bundling payments with their other customer offerings: Alipay (Alibaba), Amazon Pay, Apple Pay, Google Pay, Samsung Pay and WePay (Tencent). These “Techfins” have put technology first and financial services second when developing their ecosystems. But access to customer payments will bring data and insights to drive future financial product offerings. On relative terms, how does Canada size up when it comes to Fintech innovation? Michael King: Canada remains in the top 10 for Fintech innovation with investment by both start-ups and incumbent banks, insurance companies and asset managers. Canada has been gaining ground in key areas of Fintech, namely payments, cryptoassets and blockchain, online lending, and wealth management. On a public policy basis, what has been done so far? Michael King: Federal politicians in Canada are pursuing a policy of benign neglect towards the Fintech sector, preferring to leave policy to provincial governments and regulators while focusing on other innovation priorities. Canada has not published a national strategy on Fintech, none of the funding for superclusters was directed to Fintech, and no politicians are offering speeches to support this sector. The only recent indication of support is the public consultations on open banking, which has already been adopted in the European Union, United Kingdom and Australia. Canada prefers to be a follower on open banking, balancing the need for more openness with the desire to maintain a sound and stable financial system. 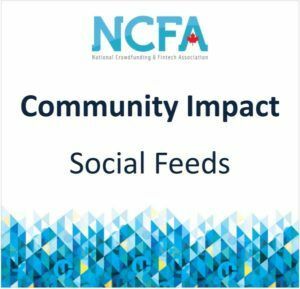 TORONTO – March 26, 2019 – The National Crowdfunding & Fintech Association (NCFA) will kick off FFCON19 – its annual FinTech, blockchain, and AI conference taking place in Toronto April 3-4, with the Toronto screening premiere of Alex Winter’s deep-dive blockchain documentary, “TRUST MACHINE: The Story of Blockchain”. TRUST MACHINE, written and directed by award-winning filmmaker Alex Winter (DeepWeb, Downloaded) and narrated by Rosario Dawson, explores the evolution of blockchain, cryptocurrency and decentralization and examines the implications from ethical, political and social perspectives. Winter follows tech innovators striking a raw nerve, as banks and network pundits rush to condemn volatile cryptocurrencies and blockchain technology. He reveals how proponents of blockchain are already using the technology to build networks that address real world problems such as fighting income inequality, the refugee crisis, and world hunger. Now in its 5th year, FFCON19 will bring together prominent industry experts, entrepreneurs, professionals, regulatory bodies and ecosystem stakeholders in fintech, blockchain, digital assets, AI, capital markets innovation, and alternative finance to discuss Canadian fintech and its ability to innovate and globally compete, the latest industry developments, emerging regulation, trends and thought leadership in a fearless framework and forum. The two-day event, taking place April 3-4 in Toronto, will feature inspiring keynote addresses and panel discussions with industry leaders, pitching competitions, awards, and prime networking opportunities. FFCON19 will screen TRUST MACHINE on Wednesday, April 3rd at 1:10 p.m. followed by an exclusive fireside chat with John Lyotier, CEO of RightMesh, who features in the documentary. John Lyotier is also participating on a panel the following day April 4th, discussing how disruptive technologies are transforming finance, culture and society.